1. Write the full form of SWIFT. 2. When was the Citizen Investment Trust established? 3. Write any two examples of indirect expenses. 4. Who appoints the Auditor General? 5. How many accounts and columns are there in Bank Cash Book? 6. What is report? Explain any four types of it in brief. 7. What is filing? Why is filing necessary in an office? 8. Define Home Trade. Describe its four procedures orderly. 9. Mention any two similarities and any three dissimilarities between government accounting and business accounting. 10. How many parts are there in Budget Sheet? Introduce them. 13. Prepare balance sheet of Karnali Wool House for the fiscal year 2073/074 on the basis of the following particulars. 14. Give an introduction of the Central Bank and explain its any six functions. 15. Prepare A.G.F. No. 10 (Goshwara Voucher) of District Administration Office, Siraha on the basis of following transactions. (a) On 2072-4-2 received Rs.20,00,000/- as revolving fund through Nepal Rastra Bank. (b) Rs. 8,00,000 paid for computer through cheque no. 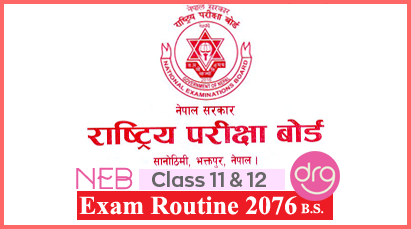 103 on 2072-4-20. (c) Rs. 50,000 provided as an advance to Section Officer Harkaman Tamang for travelling expenses through cheque no.109 on 2072-4-22. (d) The salaries of Shrawan distributed from Rs. 5,00,000 deducing the amount Rs. 50,000 for Provident Fund through cheque no. 122 on 2072-4-30. (e) On 2072-4-31 Section Officer Harkaman Tamang's advance for the travelling expenses was being cleared by approving the bill of Rs. 55,000 and excess expenditure Rs. 5,000 paid to him issuing cheque no. 126. 16. Prepare statement of expenditure of District Forest Office, Nuwakot for the month of Mangsir, 2074 from the following particulars. 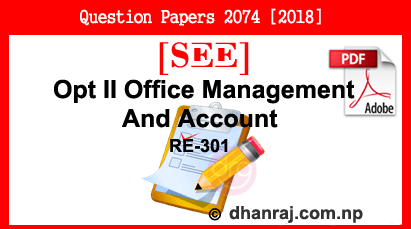 0 Response to "Optional II Office Management And Account | Exam Paper | 2074  | RE-301 | SEE"